This drawing is now available as a print on RedBubble! I love Slime Rancher so much. All of the current basic slimes. My personal favorite in the game is the Puddle Slime, I love how they just float there happily. Ah... I remember finding this drawing a little while back. I even set it as the lock screen on my iPad for a little while! I wish I could say something particular that I like about this, but it's all just very well done! The rad slime is waay too cute, and that's one of the cutest puddle slimes I think I've seen! The goldie riding on the phosphor slime is just adorable, and that was a nice touch, with the heart beet and the rock slime! Overall; this picture is just too cute! I am curious though; Did you draw this before the puddle slimes were redesigned? I'm assuming you did, since the modern puddle slimes don't have a mouth, and yours also has the same color as the old puddle slimes. It's just kinda interesting, since the puddle slime in this picture kinda resembles their modern look! I believe I did the puddle slime before the redesign, I always imagined them having a more watery consistency and not being as rounded as the other slimes. I didn't expect you to reply, but this was a nice surprise! Funny enough, I think the developers might've actually got a similar idea about the Puddle Slimes being more watery, considering what they said in the "description" for the Indigo Quarry update, which was when the Puddle Slime was redesigned. 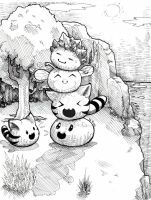 "Puddle slimes have received a graphical overhaul and are now much more puddle-y." Buut anyways, I think I should probably go before I write any more. Haha I always try to reply when I can! I loved the redesign apart from removing the smile, I loved that smile, but they're still my favorite, I can never get over that noise (even if the lava slime makes the same noise). There's been demand for an updated version of this with all of the new slimes, just need the time to sit down and record it. I love this drawing, I watched the speed draw on YouTube too, this picture, no, this artwork is my IPads lock screen background. Look at that adorable Tabby! Quick get the tabby and honey plort!!! My favorite is also the puddle slime for the same reason! Duh, how can someone live without that precious little ball of goop?